Remember when you were a kid, catching Pokemon in the backyard? Well I think that we should share those delicate moments right now......I used to catch Pokemon out in the yard like Caterpies and Pidgeys and stuff. And when I'd battle my friend, he'd catch like a Rapidash and stuff. I got mad at him so I stoped playin. lol what about you guys? I used to bring my meowth to school with me, but everyone sat on him in assembly. lol.....I also had a dream I was in the ocean with a bunch of Mantines swiming around my feet. It was cool and then It was like Pokemon snap, there would be the NEW Mantine thing like in the game when you take pics lol.....wierd huh? *reminiscing* my sister and I used to play that we were trainers on a big adventures like on the show. I had the better imagination, so I had to describe everything and act out most of the pokes. my sister loved that I could do all the voices just right. A long time ago I used to think Pokemon actually existed. I would go looking for them, and I was sad because I never found them. All my friends thought I was crazy!! 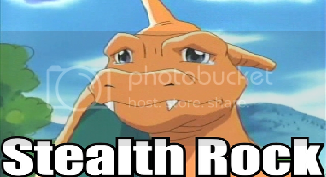 wait................pokemon dont exist? tell that to my teacher, he'll get furious! i remember when i was little looking for pokemon everywere. closest i ever came was a spider in the bushes i found that looked just like a spinerack only it was smaller and i stuck it in a plastic pokeball and kept it as a "pet" until about a month later when i noticed it didnt evolve. I remember me and my friend used to draw some not-created Eevee-lutions, Like leafeon when it didn't exist.. Also we pretended to be Espeon and Umbreon journeying Johto.. Good times..
Also we used to spend hours on the brand new game boy advance (the old, chubby one) playing pokemon ruby.. Good times.. 2003 rawks.. I also remember in the 3rd grade, at lunch recess, a bunch of kids would gather around the jungle gym and have Pokemon battles. I didn't really hang out with those kids, though. The Pokebattle Arena: A great place to Battle Friends, and take Diamond and Pearl to the next level!!! 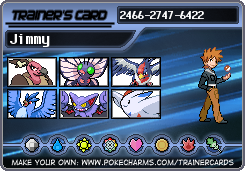 I used to have a like little episodes with my friends and I was the gym leader. My party was: Alakazam, Persian, Dewgong, Charizard, Blastoise and Starmie. me and my brother played games with our pokemon trading cards. yeah good times. oh and mudget, i HATE people who think they know everything but don't. i sympithize. Three of us used to have pokemon battles - 2 trainers and 1 referee. My friend used to get upset because he didn't know the gsc pokes so we'd always beat him. LOL, one time i couldn't write stories without having me battle my 'alter ego' using pokemon, and one time i actually got my teacher so frustrated she left the room bright red. I used to try and make Team Rocket REAL! I wanted a costume of theirs and go around my school stealing things. I must have been really retarded, considering I was in 9th grade at high school surrounded by rednecks! I didn't do that though. I just did something close to that retardedness. I wore a Pokemon Baseball cap all year long through 9th grade. I've pretty much had my own little "world" ever since I tried writing out what happened in my Red game in story format. Never got anywhere, but for me Cinnibar Islad is always "home" and in each new game, I pick a city to live in for the duration of the game.